As of 2017, only one in three FWISD third-graders read on grade level, severely limiting the city’s education pipeline and pool of human capital (2). Through the support of a backbone organization and partners aligning their activities through Collaborative Action Networks in four proposed focus areas – School Readiness, Child Well-Being, Expanded Learning and Reading Resources – Read Fort Worth will support partners, strategies and resources to significantly improve early childhood literacy and ensure that all Fort Worth children are successful in school and in life. Elementary schools have community supports in key areas such as out-of-school time, reading resources and reading mentors. 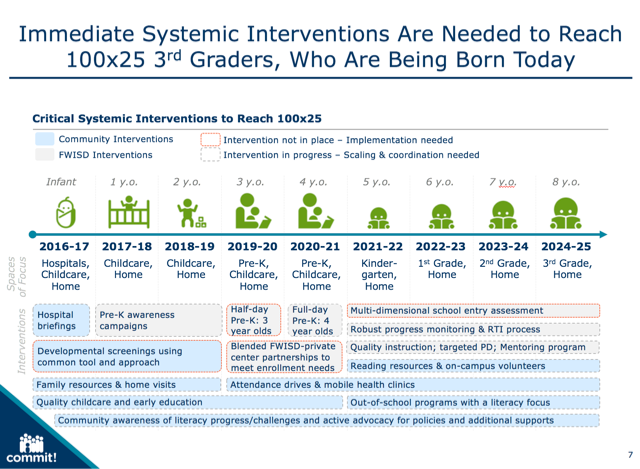 To reach the 100x25 goal, an estimated 4,800 children who will be third-graders in 2025 need additional community supports and interventions. FWISD must average 8.4-percentage point per year growth in the rate of third-graders reading proficiently. Rapid implementation of high-impact interventions is critical to realize such growth, including in the short term placing the most effective teachers with students who need them most, increasing student attendance to drive academic achievement and enhancing access to quality early learning and Pre-K options. If no action is taken, at the current average annual growth rate of 1 percent, only 41 percent of third-graders in 2025 will be able to read on-level, leaving 4,800 students behind. Fort Worth must build out a robust, whole system of care and learning (Figure 1) in order to support all children who were born in 2016 and will be third-graders in 2025. In analyzing gaps in the current system, several key strategies have been shown through national research and case studies to be the most impactful levers to drive early learning success. Among those strategies are increasing participation in quality early learning and Pre-K, reducing and mitigating the impact of Adverse Childhood Experiences (ACEs), incenting highly effective teachers and leaders to highest need campuses, and maximizing attendance and reducing chronic absenteeism and mobility. To support learning both inside and outside of school, many strategies will be driven by Fort Worth ISD. The school district is the principal entity responsible to execute the educational strategies and tactics designed to achieve the 100x25 literacy goal. It will communicate its comprehensive strategies for children in Pre-K through third grade to Read Fort Worth through participation in the Executive Council and Collaborative Action Networks, and work through the collective impact organization to identify resource needs, support and other avenues through which community efforts can drive early childhood literacy. Other strategies will be driven by the broader community through the backbone organization, existing Action Networks and those to be formed around key outcomes or indicators that drive third grade reading achievement. While some interventions are lacking entirely, several other interventions must be better coordinated and scaled to the district-level. Should Fort Worth implement these strategies and build out a robust early care and learning continuum, third-graders will be strongly positioned for early literacy and a lifetime of learning by 2025. Each community-driven strategy addresses key systemic barriers in early learning. Strengthening parenting resources through newborn parent hospital briefings and expanded home visiting partnership home visits to families of toddlers. Many Fort Worth parents face hardships that may impede early development of their children. About 26 percent of Fort Worth children live in households in poverty, and only 33 percent of adults over 25 have a postsecondary degree while 19 percent of adults lack a high school diploma (3). Reaching parents to discuss the importance of literacy and parenting skills at the beginning stages of a child’s life sets a critical foundation. While individual needs and circumstances differ, all parents, regardless of income or background, need the information and support. Standardizing toddler developmental screenings using a common approach across Fort Worth healthcare providers. Developmental gaps between higher- and lower-income children have been observed among children as young as 9-months-old, and up to 20 percent of students in the U.S. experience some form of developmental delay (4). Currently, healthcare providers use different frameworks to assess and track child development, making it difficult for parents, child care providers, and schools to monitor child progress and school readiness. Working with health systems and providers to streamline developmental screening processes will support collective interventions. Increasing the quality and availability of childcare and early education. Currently, only 30 of 413 childcare centers located in the City of Fort Worth (7 percent of centers, educating 16 percent of Fort Worth children enrolled in childcare) are rated as quality (5). Levels of quality can be continuously improved by: (i) working with care providers to implement the Classroom Assessment Scoring System (CLASS) at centers across the City of Fort Worth; (ii) increasing the capacity of early childhood professionals through a data-driven professional development registry campaign and through school readiness integration with early Head Start; (iii) supporting and coordinating enrollment of eligible children in early Head Start; and (iv) supporting centers producing lower CLASS and kindergarten readiness with resources to improve instructional success. Equipping elementary campuses with robust reading resources, including materials, technology and volunteer reading mentors. About 83 percent of FWISD elementary school libraries currently fail to meet state standards for age of collections, and 20 percent fail to meet standards for quantity of books (6). Outperforming campuses routinely have more robust classroom libraries than underperforming schools and higher literacy usage rates driven by pro-active librarians and instructional leaders. Meanwhile, research shows that students who regularly read with a volunteer reading tutor can experience the equivalent to 1.5 to 2 months of additional growth in literacy over the course of a year (7). Furthermore, campuses need supports to best deploy technology for student resources, including full computers, increased bandwidth and adult training. Community action around book drives, technology, volunteer reading and other resources can provide needed on-campus supports. 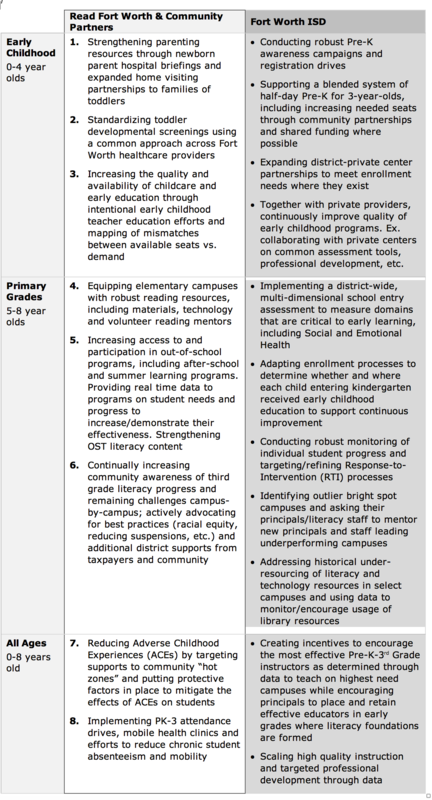 Improving access to and enrollment in quality out-of-school programs. Ensuring that OST programs include literacy content. Out-of-school time (OST) programs include summer learning, after-school and other non-school time support programs. On average, students lose one month of learning during the summer, known as “summer slide” (8). However, research shows that students in reputable summer programs regularly achieve gains of more than two months in math and reading and were a third less likely to be chronically absent the following fall than their peers (9). After-school programs meanwhile often struggle to attract disadvantaged students who need them most (10). Improving OST program registration and literacy content quality can round out student’s literacy progress. Continually increasing community awareness of third grade literacy progress and remaining challenges campus-by-campus; actively advocating for best practices (racial equity, reducing suspensions, etc.) and additional district supports from taxpayers and community. Many individuals in the Fort Worth community are currently unaware of the state of literacy and campus progress. Meanwhile, policy changes to support student growth will require community understanding and support. Reducing Adverse Childhood Experiences (ACEs) by targeting supports to community “hot zones” and putting protective factors in place to mitigate the effects of ACEs on students. Research shows that children who experience four or more ACEs are 32 times more likely to have learning and behavioral problems; at two to three times greater risk of developing heart disease and cancer as adults; and at 10 to 12 times greater risk for IV drug use and attempted suicide (11). Locally there are ACE “hot zones.” For example, just 5 percent of the geography of the City of Fort Worth accounts for 50 percent of all instances of child abuse (12). Targeting community supports to families living in such risk clusters can reduce ACEs and chronic stress that harms student learning, and also manage the impacts of ACEs on students experiencing them. Implementing community-wide PK-3 attendance drives and mobile health clinics, and reducing student mobility. In FWISD, a 1 percentage point increase in a school’s average attendance rate is associated with 9.8 percentage point gain in third grade reading scores. Schools with higher attendance are significantly stronger in reading, indicating the importance of attendance to early literacy.Student mobility, which is as high as 40 percent on some campuses, also presents a critical barrier to learning in the early grades. Meanwhile, health is often a factor keeping kids out of school. About 12 percent of children in the City of Fort Worth (26,500 children) lack health insurance and associated preventative treatments. Research has shown that school-based immunization programs demonstrate significant success in reducing the spread of the influenza virus by 45 to 70 percent (13). Multipronged attendance drives and mobile clinics can help boost attendance at schools that support student learning. Mission: To align partners, strategies and resources to significantly improve early childhood literacy so that 100 percent of Fort Worth third-graders are reading on grade level by 2025. 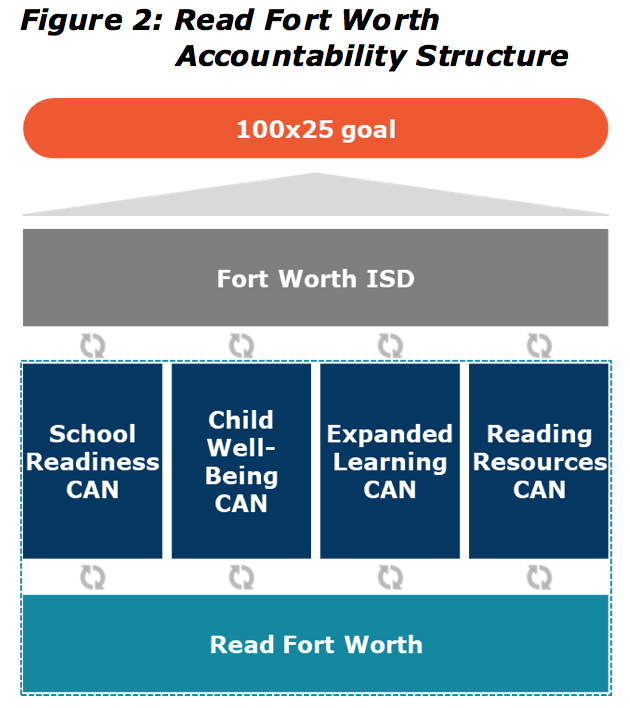 To achieve the 100x25 goal, collective action and continuous improvement take place across the Read Fort Worth backbone organization, community partners, and FWISD as illustrated in Read Fort Worth’s accountability structure (Figure 2). Read Fort Worth provides backbone support to community partners who align activities and collaborate with FWISD through focused Collaborative Action Networks (CANs). Engage partners and community: The backbone organization aligns partners under the shared 100x25 goal, invites partners to support and engage with CANs, and convenes and/or supports CANs to develop and implement strategies that improve early literacy. Support CANs: The backbone aids CANs in scoping work, defining mission and outcomes, and collecting and using data. It provides hands-on facilitation, technical assistance, meeting logistics assistance and other administrative support, as desired by Action Network leadership. It also helps CANs to identify “bright spot” practices that should be spread, communicates CAN action plans and goals, and shares results with community stakeholders. Advocate for best practices: The backbone endorses and advocates for practices most likely to drive literacy achievement to the city of Fort Worth, Fort Worth ISD, funders, service providers and other organizations. It will develop and maintain a Partnership program to identify and support organizations and service providers that adopt and implement best practices proven to drive school readiness and third-grade reading proficiency. The organization builds deep community relations and coalitions to influence improvement through community leadership. Track and analyze data: The backbone organization analyzes data and tracks against key goals focusing on Pre-K enrollment, kindergarten readiness, K-3 interim literacy assessments and STAAR third grade reading scores as key indicators. The organization also analyzes student-level data to gain insights into needs, identify “bright spots” among early learning providers and elementary schools to elevate practices likely to drive change and monitor contributing indicators. The backbone communicates data to Collaborative Action Networks to continuously improve collective efforts. Communicate and measure results: The backbone organization implements a multipronged communication strategy, including: publishing and maintaining a Data Dashboard to transparently inform the community and communicate progress campus-by-campus toward the 100x25 goal; publicly lifting up “bright spot” early learning programs and schools and best practices through speaking engagements; collateral materials; owned, paid and earned communications channels; and an annual “scorecard” event to honor improvement and practices that drive results. and support and evaluate executive director. CANs drive community action through a collaborative action process whereby partners continuously improve through collectively scoping work, planning specific interventions, implementing interventions, monitoring what works and scaling best practices. CANs ideally are co-chaired by a content expert and a community, civic or business leader with expertise and interest in the focal outcomes for the network. Consisting of members across sectors in Fort Worth, each CAN will focus on a well-defined outcome or priority and engage in consensus-driven collaborative action plans towards the focal outcome or priority. While participation in Collective Action Networks should be open, Read Fort Worth staff would work with CAN leadership to ensure that the key constituents who can enlist or coordinate the human resources required for action are engaged in the networks. CAN leaders typically convene monthly or quarterly meetings where discussion around data leads to alignment and continuous improvement in one or more well-defined projects. CAN leaders are encouraged to draft a network charter in collaboration with the backbone organization that outlines how network members are accountable to each other and the backbone organization as a whole while working on the agreed upon scope. The charter should be a living document that members mutually agree to and should be periodically revisited as the group dives deeper into its work. A sample charter would include a purpose statement, a problem statement, a project scope, network measurements and targets, membership and operating principles. Collaborative Action Networks and the Read Fort Worth backbone organization are mutually accountable to each other. The CANs have no direct reporting relationship to the Executive Council. The Executive Council provides policy direction and leadership to the overall organization, but does not directly supervise the CANs. CAN leaders are encouraged to share short, one-page summary reports with the backbone organization each quarter (generally by Aug. 15, Nov. 15, Feb. 15 and May 15 to align with Executive Council quarterly meetings). Reports should provide information in four areas: 1) successes from the past quarter; 2) lessons learned the past quarter; 3) plans for the next quarter; and 4) current barriers. The backbone organization will work with CAN leadership and the Executive Council to review community progress, scale learnings, and target supports and data to overcome barriers. School Readiness CAN: Focused on systems and interventions reaching children ages 0-5, the School Readiness CAN convenes to dramatically improve the percent of kindergarten students that are ready to learn when entering school. With the Tarrant County-focused Early Learning Alliance as its leading partner, the School Readiness CAN will focus on increasing the quality of childcare and early learning. The CAN already is actively working in the early learning space. Child Well-Being CAN: Focused on the entire 0-9 care continuum, the Child Well-being CAN seeks to reduce the number of Adverse Childhood Experiences (ACEs) that children in Fort Worth sustain and implement protective factors to mitigate the effects of ACEs. Driven by Cook Children’s and JPS Health Network, the CAN will target resources and interventions to ACE “hot spots” in Fort Worth. The CAN also will coordinate with healthcare providers and early learning experts across Fort Worth to standardize developmental screening approaches and conduct mobile health clinics. Expanded Learning CAN: Focused on early grades of school, the Expanded Learning CAN seeks to increase the effectiveness and robustness of summer, after-school and out-of-school time (OST) programs for Fort Worth children. The CAN will work with OST providers, schools, parents, and community organizations to conduct registration drives as well as literacy capacity-building initiatives to improve the quality of programs. The CAN is actively meeting and planning actions around summer learning. Reading Resources CAN: Focused on elementary campuses, the Reading Resources CAN works to equip schools with literacy tools, materials and volunteers to enhance student supports and reading environments. CAN teams are organizing book drives to support independent reading by helping stock classrooms with age-appropriate, multicultural titles, as well as mobilizing a community of volunteer reading mentors to support early grades readers across the Fort Worth ISD with emphasis on high-need campuses. The network will explore other campus needs, including technology support. 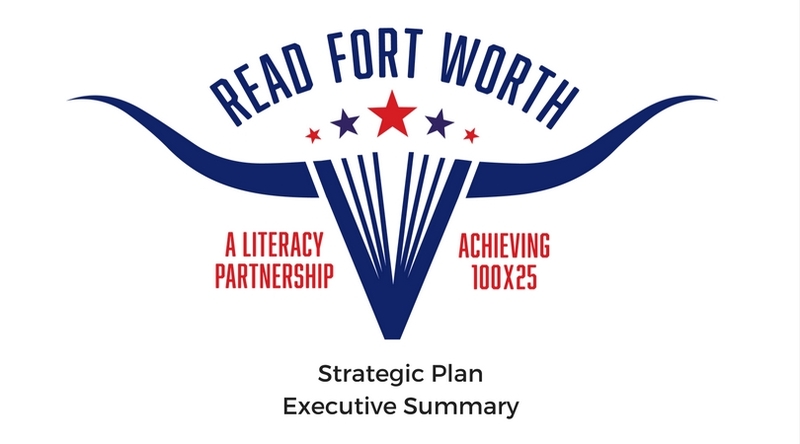 Fort Worth ISD under the leadership of Superintendent Dr. Kent P. Scribner has committed to robust ongoing relationship with the Read Fort Worth community effort and is a fully-integrated partner toward the community’s 100x25 goal. The district already is partnering with CANs in many areas, including classroom book drives, volunteer reading mentoring and early childhood partnerships. The district is also fully engaged in a pilot program of Leadership Academies, leveraging academic achievement data and strategic compensation to incent the most highly-effective teachers to teach at target high-need campuses. The Leadership Academies program includes numerous wrap-around supports around which the district and partners are committed to collaboration. Publicly highlight bright spot campus gains in 2016-17 to help drive home community’s support of strong instructional progress while celebrating those responsible for progress. Deepen relationship with Fort Worth ISD, meeting with principals to learn more about barriers and effective practices and continuing to meet with senior leadership. Support school leadership with community advocacy as needed to catalyze policy changes. Read Fort Worth’s inaugural strategic plan was developed between March and August 2017 in collaboration with a consultant team comprising representatives from StriveTogether of Cincinnati and the Dallas-based Commit! Partnership, both national leaders in cradle-to-career collective impact work. Jeff Edmondson, founder and former executive director of StriveTogether, and Michael Mozina, senior manager of network experience, provided invaluable support in assisting the Fort Worth community in building a civic infrastructure to support Read Fort Worth’s work. Edmondson and Mozina led sessions in April and June 2017 that established a shared vision for the organization and an accountability structure to facilitate organizational and community action toward the 100x25 goal. The Commit! Partnership team, led by founder and executive director Todd Williams, provided research, analytics and regional and national insights to illuminate strategies most likely to drive growth in Fort Worth ISD third-grade reading proficiency. Read Fort Worth would like to express a special thanks to Ashwina Kirpalani, director of analytics; Chris Hudgens, manager of regional analytics; and Zak Ostertag, manager of strategy and analytics, for their dedication to the project, leadership and passion for using educational data insights to drive systems change. Texas Education Agency, STAAR 2016-17. U.S. Census American Community Survey, 2015. Tamara Halle et al., “Disparities in Early Learning and Development: Lessons from the Early Childhood Longitudinal Study – Birth Cohort (ECLS-B),” Child Trends, June 2009, www.childtrends.org/wp-content/uploads/2013/05/2009-52DisparitiesELExecSumm.pdf. Quality centers are either rated 4 Star by Texas Rising Star or are accredited through NAC, NAEYC, AMI or AMS. FWISD Asset Inventory conducted by Read Fort Worth and Leadership ISD, 2016-17. MDRC, “Mobilizing Volunteer Tutors to Improve Student Literacy,” http://www.mdrc.org/publication/mobilizing-volunteer-tutors-improve-student-literacy. SERVE, “Summer School: Research-Based Recommendations for Policymakers,” http://www.serve.org/uploads/publications/SSRecommendations.pdf. Manpower Demonstration Research Corp, “Challenges and Opportunities in After-School Programs: Lessons for Policymakers and Funders,” http://files.eric.ed.gov/fulltext/ED505368.pdf. Pediatrics, December 2005, “A Pilot Study of the Effectiveness of a School-Based Influenza Vaccination Program,” http://pediatrics.aappublications.org/content/pediatrics/116/6/e868.full.pdf.